One night I found myself with a subscription to Netflix and nothing to do. I fired up my PS3 and happened upon a show called Lie to Me. I ended up staying up the entire night watching it, the rest is history. I enjoy the drama format for its length, and absolutely love it because of the engaging and excellent stories that are regularly churned out in drama land. I started this blog to rant, rave, and generally ramble on about the shows I am watching. I love fan girling about the shows that make me happy- and going all sarcastic on the shows that make me shake my fist like an angry ahjumma. What I love even more is the Korean Drama/Variety blogging community- from readers, to bloggers, to subbers, I am continuously impressed with how this community keeps the interesting discussions flowing without losing sight of the artistic (or just plain fun) relevance of the medium. In “real life”: I love me a good romance. I have been squeeing and sighing over love stories as long as I can remember, often to the complete annoyance of those around me. From Johanna Lindsey to Jane Austen to the Hong Sisters I cannot get enough of an intriguing, well-paced love story (even the wacky makjang ones). I grew up with flower child parents so my life experience has been anything but boring. I have had a love of the absurd and sarcastic ingrained in my soul, and I never fail to laugh at inappropriate times (sorry Grandma). I work in finance and I love to read. My favorite phrase is cheers and I adore small fluffy dogs and a cute purse. The Summer I graduated from college was filled with excitement, ice cream, and Korean dramas! The first Korean Drama that I ever watched was “Crazy for You” with Yoon Kye Sang and Lee Min Yeon. I ate German Chocolate ice cream every day and was so depressed—I hated it! The first drama that I liked was Coffee Prince with Gong Yoo and Yoon Eun Hye. The first drama I LOVED was Hong Gil Dong starring Kang JI Hwan, Jang Gun Seok , and Sung Yuri. 2008 was a cray cray summer—ever since then, I have watched over 250 dramas from Korea, Japan, and recently added to my list is Taiwan. To say I have one drama that I love for all time is like asking a parent which child they love best… Just not plausible. 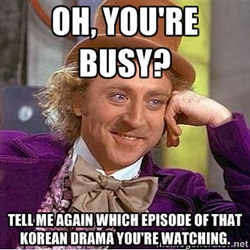 The reason I love to watch Asian dramas is because they eventually end (and end quickly). Why do I have to wait 9 seasons to see How I Met Your Mother? The dramas also make me think and explore the inner complexities of human nature, relationships, and cultural traits. Love of my Life, Shoes, Hot Guys, Ice Cream, Korean Dramas, Love being from Cali!